Hailed by the Calgary Herald as having "beauty of tone and a wonderfully flexible phrasing", Sara Hahn is currently the Principal Flutist for the Calgary Philharmonic Orchestra. From her start in band class at the age of twelve, Sara has gone on to study with Canadian flutists Jan Kocman of the Winnipeg Symphony Orchestra, and Susan Hoeppner who is an internationally renown performing/recording solo flutist. Sara has graduated with honours from the University of Toronto, receiving a Bachelor in Music Performance degree. Prior to accepting her post with the Calgary Philharmonic in 2006, Sara has performed professionally in the position of Assistant Principal Flute/Piccolo with the Vancouver Symphony Orchestra. In 2002 she completed an extensive three week tour of Japan and Hong Kong with the National Youth Orchestra of Canada. Sara has also performed as a soloist throughout Canada, the United States and Brazil as a guest of the Campos do Jordao International Winter Festival. Most recently she was invited to perform a feature recital in the first ever Canadian Flute Convention in Ontario in June 2013. Locally she has been a featured soloist with the Calgary Philharmonic Orchestra, the Kensington Sinfonia, the University of Lethbridge and the Instrumental Society of Calgary. She has a long list of awards and trophies for her solo flute performances, including the University of Toronto concerto competition (resulting in a solo performance with the UTSO), first place in the National Finals of the Canadian Music Competitions (19&under) and the Junior Musical Club Concerto Competition in Winnipeg - which gave her a debut performance as a soloist in front of an orchestra at the age of seventeen. In 2005, Sara was awarded first prize of $10,000 as the winner of the Women’s Musical Club of Winnipeg Doris McLellan Competition for Solo Performance with Orchestra. 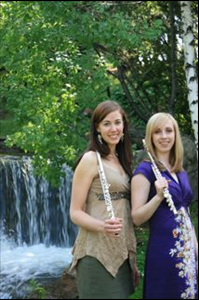 In addition to her performance career, Sara has been quite active as a flute teacher and coach across Canada for over a decade. Her enthusiastic approach to sharing musical ideas and techniques have ensured that several of her private students have been accepted into both Undergraduate and Graduate programs at the University of Manitoba, University of Calgary, and McGill. Sara is proud to be a co-founder and active member of the Green Banana Flute Studios, an innovative teaching and performing collaboration. See www.gbflutes.com for more details.